Varaždin County is situated north of Zagreb, around the town of Varaždin, capital of Croatia until the 18th century. The County emerged in the 9th-10th centuries, and was certainly in existence when the Hungarian dynasty took over the Croatian crown. It was one of the few regions of Croatia that remained under the jurisdiction of the Parliament in Zagreb when everything else was lost to the Turks. In a great battle fought in 1593 against the Turks by the town of Sisak, the victorious Croatian army was led by the ban, Count Toma Erdedi (Hungarian, Tamás Erdödy). For this victory he was granted in 1607 the inheritable title of the župan of Varaždin County. The Erdödy family held the hereditary title (and administration) until 1845, and even later when there were several župan from that noble family. The symbols of Varaždin County are prescribed by Decision Odluka o opisu i uporabi grba i zastave Županije Varaždinske, adopted on 21 June 1995 by the County Assembly and published on 22 June 1995 in the County official gazette Službeni vjesnik Varaždinske županije, No. 10. Decision Odluka o izmjeni i dopuni Odluke o opisu i uporabi grba i zastave Županije Varaždinske, adopted on 29 September 1995 and published on 30 September 1995 in Službeni vjesnik Varaždinske županije, No. 15, amends the previous Decision. In the description of the flag, it is unambiguously stated that the coat of arms shall be set next to the hoist on both sides of the flag. The Amendments might have been produced upon the Ministry's recommendation. The symbols are described in the County Statutes Statut Varaždinske županije published on 2 July 2009 in Službeni vjesnik Varaždinske županije, No. 15. This is repeated in the current County's Statutes Statut Varaždinske županije (pročišćeni tekst), adopted on 14 February 2011 and published the same day in Službeni vjesnik Varaždinske županije, No. 15, No. 3 (text). The flag of Varaždin County is the same as the flag of the Town of Varaždin, with the addition of the County's coat of arms. The coat of arms is offset to the hoist, so that its vertical axis is from hoist at 6/10 of the flag height. The size of the coat of arms on the flag is rather vaguely established in the Decision, prescribing that it should "cover the upper red stripe only with its insignificant part, and the lower red a little bit more". According to my calculations, this makes its height to be just about 2/3 of the flag height. The County's symbols were defined in a contest held in 1995 and announced in the annual program of the County Assembly Program rada Skupštine Županije Varaždinske za 1995. godinu, adopted on 22 February 1995 and published on 27 February 1995 in Službeni vjesnik Varaždinske županije, No. 3. The jury awarded two prizes - one for the flag proposal (won by Tomislav & Edita Goluban from Zagreb, who kindly provided the information), and the other for the coat of arms proposal (won by Ivica Kruhoberec). - a flag proposal including the winning coat of arms proposal: a red flag with two white stripes (1:1:2:1:1), and the arms "Quarterly, 1. and 4. Gules two barrulets argent, 2. and 3. Azure two mullets between two barrulets wavy-counterwavy or. Inescutcheon or issuant from a triple mount vert a wheel proper from which is issuing a semi-deer rampant proper". The jury called upon the artists to work together on a common design for the flag and coat of arms based on their winning designs and matching the regulations issued by the Ministry of Adminstration. In 1763, Empress and Queen Maria Theresa confirmed the coat of arms of the County, which is essentially equal to the family coat of arms of the Counts Erdödy, thay is "Quarterly, 1. Gules a crowned spread eagle or, 2. and 3. Azure, two bars wavy argent between them two six-pointed mullets or, 4. Gules, a masoned wall with a tower argent port and windows brunâtre. Inescutcheon or, on a triple mount vert a half wheel brunâtre issuant on it a deer issuant proper". The shield was oval in 1763, with a baroque ornamented golden border, and crowned. This remained the coat of arms of the County until 1922, with one notable exception in 1848. During the 1848 events, a new coat of arms was proposed and used for a short time, as well as a flag to accompany it. In 1993, the County Assembly decided during its second session that the County should have symbols, and tasked the County Mayor to form an expert commission to review the historical symbols, and to advize whether they should be re-adopted or a new design should be sought via a public competition (Varaždinske vijesti, 7 July 1993). Zdenko Balog, a member of the County Assembly, explained why the County should adopt its historical symbols without any change. He turned down various "accusations" that the Erdödy coat of arms is not "Croatian enough" and that they were "foreign oppressors", that the elements of the arms are "non-Croatian", and other, mostly ignorant accusations that were presented in the Assembly's discussion and in media afterwards(Varaždinske vijesti, 29 September 1993). The 13-membered commission for the symbols, came up after four sessions with a proposal of Decision on the coat of arms and the flag. The head of the Commission, Ljerka Šimunić, presented the commission's finding to the County Magistrate. The commission proposed that the historical coat of arms is re-adopted. Regarding the flag, the commission proposed that the historical flag is also re-adopted, however, with a slight change of its dimension - the historical flag is sized 100 cm x 118 cm, the new flag should be in the standard size, 100 cm x 200 cm. Some of the members of the Magistrate, namely Radimir Čačić (eventually a Minister in 2000, and, currently, a Deputy Prime Minister) objected to that as he considered the dimensions to be an important part of the historical identity, so they should not be changed. He also insisted that a handbook or rulebook on graphical and usage standards should be included in the prescriptions. In the discussion, other expressed opinions that the symbols should be changed, and, eventually, it was decided that the commission's findings should be presented to the County Assembly (Varaždinske vijesti, 22 December 1993). In 1994, during a session of the County Assembly, member Zdenko Balog asked to the Magistrate if the contact had beem made with the appropriate Ministry to gain guidelines for the adoption of the symbols, "as some counties have made big steps ahead in the issue, while Varaždin County has been stalling already for four months" (Varaždinske vijesti, 20 April 1994). The Assembly discussed the proposed Decision on the County symbols, ending up with the conclusion that a commission shall be formed to run a competition for "style and graphic solution" for the new symbols. Thus, a year and four months after the establishment of the previous commission, the Assembly decided to appoint another one. The County Mayor explained that the aim was to gained some new ideas; after reviewing them, it would be decided whether to go with the old ones or something else. The members from HSLS and HDZ supported the old design, while those from HSS did not, arguing that "we have exited history and should move towards future". The basic historical facts of the symbols and the procedure held were recounted; it was explained that the new legislation and the expected Regulations on the adoption of the symbols, which the Ministry had not issued yet, slowed down the process (Varaždinske vijesti, 9 November 1994). Pr. Damir Hrelja, from the History Archives of Varaždin, reacted to the decision of the Assembly not to re-adopt the historical symbols, providing further explanations on why they are important and relevant, in terms of heraldic but also historic context (Varaždinske vijesti, 23 November 1994). A member of the Assembly, Zvonimir Kramarić replied to Hrelja, explaining why the Assembly was against the re-adoption. Kramarić explained that the arms are expressing "only Varaždin" and nothing about Croatia, and that the crown above it is a monarchistic, Habsburg crown. Hr also claimed that the coat of arms had not been used for 150 years [which is wrong, since it was still in use in the 1920s] and had therefore "lost its identity" (Varaždinske vijesti, 7 December 1994). This yielded reaction from Zvonimir Balog (Varaždinske vijesti, 21 December 1994) and Damir Hrelja (Varaždinske vijesti, 4 January 1995). The Assembly did not adopt either of the two designs that had been submitted in the new competition. Instead, a new commission was appointed to run another competition,composed ofJosip Herceg (Head of a Department in the County administration), Zdenko Balog (member of the Assembly), and Teodor Abramić (Vice Chairman of the Assembly). After several hours of disucssion, the new proposal got only 4 votes in the Assembly session while the old, historical design, got 13 votes - not enough (34 members were present). The previous commission proposed to the Assembly the best designs from the competition (see above) - the flag by Edita and Tomislav Goluban, from Zabok, and the modernized coat of arms by Ivica Kruhoberec, from Varaždin, and Nenad Crnko, from Kelemen. All of the designs that had been received in the competition were exhibitied in the halls; beside the winning design, there were several done by known designers, such as Boriš Ljubičić, from Zagreb, Krešimir Ferinec, and Tihomir Fišer, from Varaždin. Unofficial sources claimed that the new competition may be invitational only (Varaždinske vijesti, 5 April 1995). The County Magistrate received guidelines from the Ministry of Administration regarding the adoption of the symbols, where it is stated that historical designs should be used. The commission, now enlarged with a few new members, prepared guidelines for the designers to enable them to comply with the Ministry requirements. As a side note, Balog mentioned various unprofessional designs that had been adopted as municipality symbols; he highlighted the amusing example of an unnamed municipality that adopted a coat of arms depicting a castle that is today a hospital for alcoholic, surmounted which a bunch of grapes (Varaždinske vijesti, 10 May 1995). The County Magistrate adopted the proposal submited by the commission, with the historical coat of arms modified in the shield shape and the flag without the different design (Madonna) on the reverse, in accordance to the guidelines povided by the Ministry. The designs were to be submitted to the County Assembly for adoption. It is mentioned that the display of the coat of arms in the flag off-set towards the hoist was done in the "golden section" (Varaždinske vijesti, 7 June 1995). The ceremonial flag of Varaždin County is prescribed in Article 2 of Decision Odluka o proglašenju Majke Božje s Isusom zaštitnicom Županije Varaždinske, adopted on 18 July 1996 and published on 19 July 1996 in Službeni vjesnik Županije Varaždinske, No. 13. The figure of the Mother of God with Jesus depicted on one side of the historical flag of Varaždin County dated 1778, preserved in the City Museum of Varaždin, shall be the symbolic depiction of the County's patron. A copy of the flag from Paragraph 1 of this Article, produced following the original, shall be displayed in the County Mayor's Office, and shall be hoisted next to the flag of Varaždin County, on the occasion of celebrations on the County Day. The flag with the depiction of the patron of Varaždin County may be hoisted in other occasions that are important for the County, as decided by the County Mayor. Three historical flags, found in the County Assembly Hall, were moved in 1925 to the Varaždin Town Museum. The first, oldest flag was used to be displayed in the main Assembly Hall, while the second flag was held in the Mayor's office and used during various ceremonies outside. The third flag was disused after 1848. 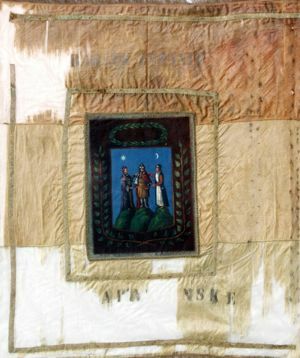 In a very bad state, the flags were sent to Zagreb for restoration, to be eventually displayed in the Varaždin Town Museum permanent exhibition (Magdalena Lončarić, Varaždinske vijesti, 27 January 1993). The website of the Varaždin Municipal Museum has a section dedicated to the exhibition Year 1848 in Varaždin. It shows photos of several flags, including the 1778 and 1848 flags of the Varaždin County. The oldest known flag of Varaždin County was presented in 1778 to the County by its County Mayor, Ivan Nepomuk Erdödy (1770-1784). The flag is made of silver brocade, rectangular (100 cm x 118 cm), horizontally divided in five red and white stripes, with a gilded fringe and two tassels at the fly corners. At the centre of the flag, a rectangular painting (oil on canvas) is appliqued on both sides, showing on the obverse (photo) the County coat of arms (47 cm x 62 cm), and, on the reverse the icon of Madonna with Baby Jesus. 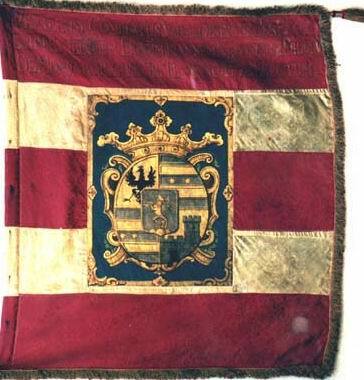 In the top stripe above the coat of arms, an inscription in three rows states that it is the flag of Varaždin County that was ordered in 1778 by Ivan Nepomuk Erdödy of Monöyorokerek. The staff, spirally coloured red and white, is topped with a metal spike and with a white ribbon on it. A replica was made to be used as the County ceremonial flag. The second known flag of Varaždin County, dated from 1797, is very similar to the first one, somewhat smaller, having three red-white-red horizontal stripes and paintings of the same design as in the previous flag. The inscription here is in the two red stripes above and below the coat of arms, recounting that this is a flag of Varaždin County made on the occasion of the general insurrection (mobilization) against the French.It is also attached to a spirally coloured staff with a metal finial. Namely, King Francis II called the nobility to raise irregular people's army to help defending against Napoléon. This army was provided with this flag by the County Mayor. Afterwards the flag was used as the County flag. The third known flag of Varaždin County, from 1848, is horizontally divided red-white-blue, again with painting on both sides. The obverse now has a different coat of arms photo) depicting three Slavic brothers (Čeh, Leh, and Meh) shaking hands. 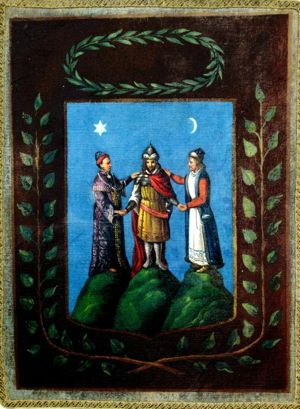 There is a story connecting the brothers with the town of Krapina, then within the Varaždin County, and star and crescent are taken up from the "Old Croatian" coat of arms. The reverse (photo) again has the icon. The inscriptions are on the obverse above the coat of arms, now in Croatian, "Barjak Županije Varaždinske 1848. ("The Flag of Varaždin Varaždin County 1848"), and, on the reverse above the icon, "Budi nam pomoć" (Be Our Helper). The County Assembly decided on 30 May 1848 that the Erdödy family's inherited title on the County shall not be recognized any further, and following that that the County's coat of arms and flags showing the family's coat of arms should be replaced. The flag was not used long, as with the end of the revolution, the Erdödy regained their position.